Ten years ago Canon launched its 12.8MP EOS 5D, a camera that opened the door for many enthusiasts to shoot with a full-frame sensor. 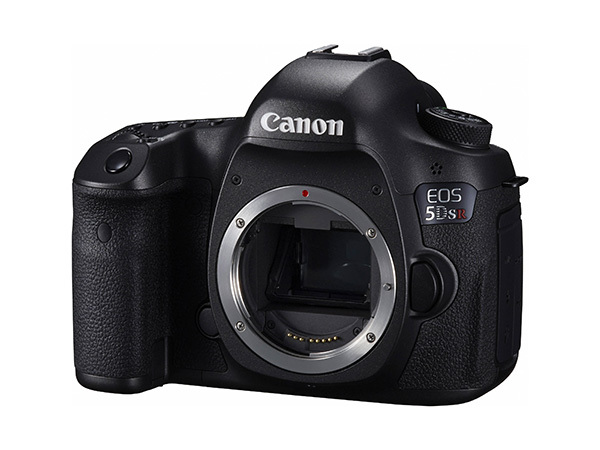 Fast-forward a decade, and Canon has continued the 5D line with the launch of the S and S R models. This test focuses on the S R (£200 more expensive), but the only real difference between the two is the S R has an additional filter to counter the effects of the sensor’s low pass filter – we’ll explain that later. The 5DS R sits alongside the 5D MkIII, boasting more pixels than Nikon’s D810 (36.3MP) and Sony’s 36.4MP A7R. In fact, the 5DS R is close to Pentax’s medium-format 645Z (51.5MP). So, how does it fare in the field? We have to start with the headline feature, that 50.6MP full-frame CMOS chip. It’s not just a small increase in pixel count – the 5DS R offers more than double the resolution offered by the 5D MkIII. If this is too many megapixels for you, the camera can be used in a 1.3x or 1.6x crop mode, but it still returns a meaty 30.5 and 19.6MP respectively. Powering this sensor are a pair of Canon’s latest DIGIC 6 processors, which perform faster than the 5D MkIII’s older DIGIC 5 version. All this resolution allows for big, A0 size prints, but image quality will be compromised if sub-standard glass is used. As a result, there’s a list of recommended lenses on Canon’s website. To further increase image quality and make the most of the sensor, Canon has incorporated a Mirror Vibration Control System to reduce the vibrations and movement caused when you take a shot. What’s more, the support around the tripod socket has been reinforced to further protect the camera from vibration and shake. As mentioned, the S R features technology to cancel out the blurring effects of the low-pass filter. While this increases the risk of moiré, it improves sharpness, making the S R better suited to landscape and studio photography, and the S version for other photo disciplines. With plenty of weather sealing to protect from the elements, the 5DS R features two memory card slots to record the large files – one for SD cards, the other for CF. The rest of the exterior is almost exactly the same as the 5D MkIII, although at 845g, the 5DS R is almost 100g lighter. The autofocus system boasts 61 points, 41 of which are the more accurate cross-type points. But the number of available cross-type AF points will depend on the lens attached. 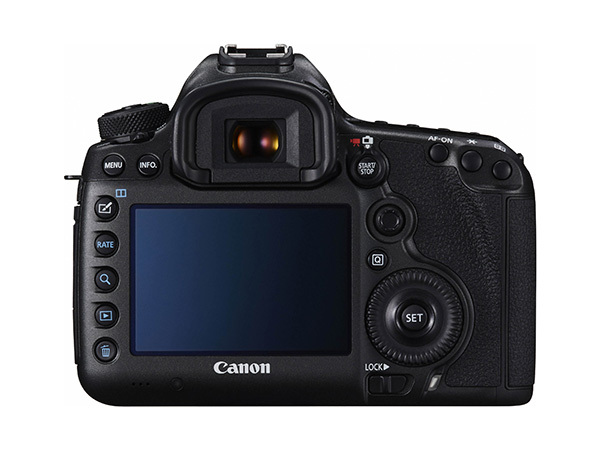 The 5DS R also offers Canon’s Intelligent Tracking and Recognition (iTR) AF technology, which makes use of colour and face information to recognise and track subjects as they move around the frame. There’s a couple of areas where the 5DS R can’t match the older and lower-priced 5D MkIII, and the first of these is the ISO range. The MkIII has a maximum ISO of 12,800 (expandable to 25,600), but the 5DS R tops out at 6400 (expandable to 12,800). Secondly, the DSLR is not as well suited for video use. Although you can shoot Full HD video at 30, 25 and 24 fps, and there is a port for an external mic, there is no headphone socket, so you can’t monitor audio directly. A USB 3.0 connection (up from USB 2.0 on the 5D MkIII) speeds up the transfer of images and video when shooting tethered – a common practice for high-end professional photoshoots. The 5DS R is a comfortable camera to hold, and the handgrip and textured rubber exterior allow for a reassuringly secure grip. The mode dial has a safety pin in the centre so it can’t be adjusted accidentally. Exposure modes are straightforward, with the usual Program, Aperture priority, Shutter priority and Manual modes in addition to Bulb and three custom modes. Canon users will instantly recognise the well-laid-out button configuration that surrounds the large 3.2in LCD screen on the rear. It’s the same as the 5D MkIII. Working through the Menu system to set up the 5DS R is equally simple – the tried and tested colour-coded navigation makes finding the right settings easy. In the field, the dual DIGIC 6 processors come into their own and do a great job of writing the huge files to the memory card reasonably quickly. Using a 32GB 90MB/sec CF card, RAW images wrote quickly (1.75secs) considering the files size. When shooting at the 5DS R’s max frame rate of 5fps, the buffer filled up after 14 frames, but cleared in 4.2secs and was ready to shoot again. JPEGs were a different story and you can fire off over 500 frames in one hit before the buffer slows. Lastly on the speed front, it’s worth mentioning that the in-camera HDR mode does take at least 3secs to merge three frames together. Remember though, the 5DS R is not a spray-and-pray camera, and is aimed at photographers seeking quality, not speed. When it comes to autofocus, the 5DS R performs well, locking on to subjects quickly and accurately whether in its Single point mode or using the 61-point Multi-focus option. For those looking to get sharp shots of moving subjects, the continuous focusing mode (called AI Servo on Canon models) will be needed. To get the best from this, it’s worth digesting the various AF preset options in the Menu system. A Predictive AI servo can be set using one of five presets and provides a powerful subject tracking its EOS Intelligent Tracking and Recognition (iTR) AF technology. One preset will ignore movement coming into the frame and continue tracking. At £3299 body only, there’s no denying that the 5DS R is a huge investment. You could buy a full-frame EOS 6D, plus some Canon L glass for the same outlay. However, this is the first DSLR in history to offer such a high resolution. The 5DS is a little more affordable at £2999, but for an extra few hundred pounds for the sharper imagery makes more sense – especially if your profession is photography. What’s more, the 5DS R is still around half the price of Pentax’s medium-format 645Z, which only offers an extra megapixel in resolution and a far more restricted array of lens choices. While the exterior and button layout is almost identical to the older 5D MkIII camera, the 5DS R isn’t just another Canon with a slightly higher megapixel count. Quite simply, this full-frame DSLR is a quantum leap forward in resolution, offering photographers who crave quality and wish to print in large formats a genuine alternative to high-priced medium format cameras. Of course, there are compromises when it comes to such a high pixel count. The 5fps burst rate means this DSLR isn’t an action camera (the 7D MkII is more suitable) and the more limited ISO range also reduces options in low light conditions. With an RRP of £3199, the 5DS R is a big investment, plus you’ll need top-notch glass to use those 50 million pixels to their full potential. Image quality is amazing though, and after using a camera of this class, many will find using another DSLR a bit of a step down. This review was first published in the September 2015 issue of Digital Photo - download back issues here.